Bath and shower aids are two bathroom disability aids that assist in retaining the independence and privacy of the elderly and those with limited mobility when they require to use the bathroom. A wide array of bath and shower aids in the form of grab rails, shower chairs, bath boards, and reclining and self-propelled mobile shower and commodes are now available in all stores of Independent Living Specialists Australia wide. Derived from well-known brands such as Care Quip, Ausmedic, Sunrise Medical, KCare and many others and specially chosen for comfort and safety of the user with the durability of the device in mind. The bathroom aids range further covers either a higher level of support or a handhold in the bathroom. Bath seats are one of the most commonly used aids as it naturally gives a sense of security and safety to the user when having a bath. It is also believed to provide many health benefits. The user could relieve stress and ease sprained and sore muscles with the use of such aids. This is one of the popular bath aids available at ILS manufactured by Hero Medical, It is supposed to very strong and built to resist corrosion. This is a foldable, height adjustable, aluminium shower chair with a plastic seat and side arms to assist the user to lower and raise into the seat. The unique design of this bath seat easily fits its base frame over the bath and made of easy to clean plastic. The strong frame swivels 360 degrees and guarded with a locking lever. Its steel frame is fitted with a plastic seat and a drainage hole. A bath lift is another aid that offers the best comfort and safety to the user. The user will find getting in and out of the bath easy and it divides into 2 parts for easy installation, dismantling and transporting. It is a powder coated adjustable steel bath rail which could be fastened onto the side of most bathtubs. Users up to 100kg could depend on this to be transferred in and out of the bath. This device can be used to transfer a patient to and from the bath easily and safely. Equipped with a height adjustable aluminium frame and durable plastic seat, the suction legs allow more stability and slip resistance to the transfer bench. The backrest is removable and usable on either the left or right-hand side of the bath. This device is a product of Hero Medical and manufactured with aluminium for durability with the seat and lid made out of a high-quality plastic. The seat is non-flexible with a removable lid for easy cleaning. It has been treated for corrosion resistance and also equipped with a splash guard and height adjustable extension legs. All these devices provide comfort to those with limited mobility and can be taken anywhere as it does not take much time to install in the required places. 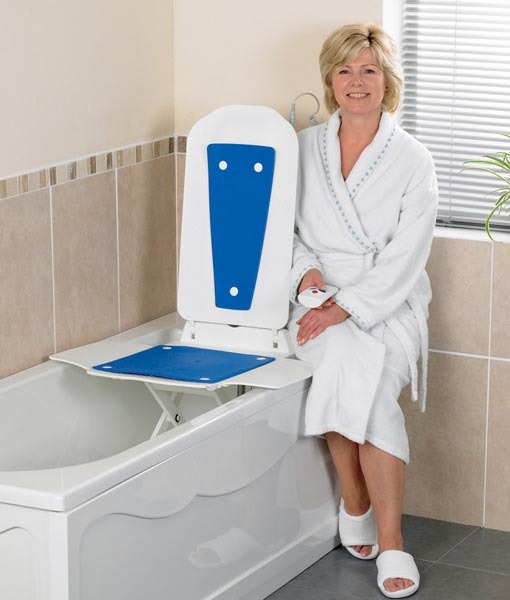 This entry was posted in Bath Aids, Bathroom, Buying Guide, Comfort, Community, Daily Living, disability aids and tagged aged care, Bath Aids, bath shower aids, bathroom aids, Over Toilet Aids, shower chair, shower stool.